For the past few years it has been written into the Building RegulationsThese are the mass of regulations that cover safety, health, welfare, convenience, energy efficiency etc. in the way buildings are constructed. Not to be confused with Planning consent (which is more to do with whether you can put up the building in the first place). See more on the regulations that new and replacement gas boilers have to be of the condensing type because they are potentially more efficient. This is because they can extract the latent heat of evaporation out of the steam before it goes up the chimney or out of the fluepipe to conduct gas, typically ventilation air or boiler exhaust. see Flue. The actual efficiency is measured by the SEDBUK rating. The government database lists all UK boilers, past and present. However, how efficient they are in practice is a different matter. More on that later. conventional , where the boiler heats the central heating system and also heats up a cylinder full of water ready for baths and washing. After the hot water in the cylinder has been used you have to wait at least half an hour before it has heated up again. combination , where the boiler is split into two separate parts – one part heats the central heating and the other part heats up domestic hot water instantaneously and continuously so in theory you could have a never ending shower. 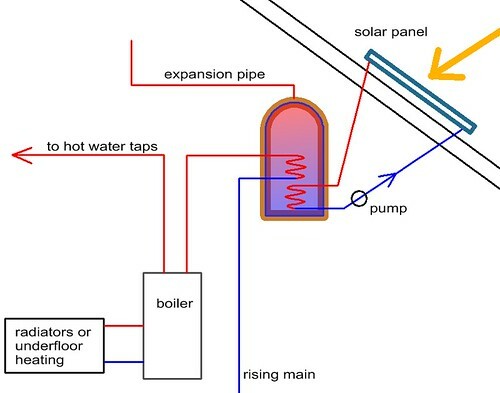 It gets a little more complicated when solar collectors are involved because they are normally used to pre-heat domestic hot water. The boiler then tops up the heat if it is not warm enough. 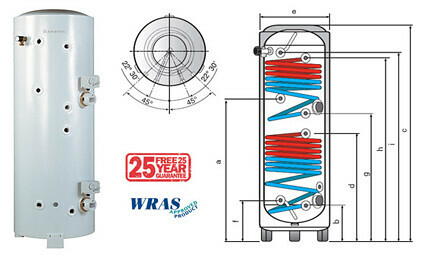 With the conventional boiler setup there is an extra large hot water cylinder with two coils in it instead of one. The second coil is at the very bottom of the tabtank and is connected to the solar panels. With the combination boiler the mains cold water feed needs to go through a coil in a tank which is heated from the solar collector so one of the advantages of combination systems (not needing a hot water cylinder) is lost. It is also important to make sure that the boiler you choose will work properly in this mode. Probably the time to get advice from competent installers. Enter the modulatinga modulating boiler is able to gradually turn itself up and down depending on how much heat is required. This is more efficient than cycling on and off. boiler which can turn itself down when needed rather than constantly cycling on and off. These boilers tend to modulate from their maximum output down to about 10kW or even 7. This may still not be low enough if your house is very well insulated. A superinsulated house may only be using a couple of kilowatts for heating even in very cold weather (and maybe 3 kWkilowatt - a measure of how fast energy is flowing. e.g. electricity might flow through an electric kettle element at the rate of 2 kW for DHWDomestic Hot Water. see the section on domestic hot water heating when needed) so the boiler will still be cycling. This is approaching the territory of the PassivhausSee more on the Passivhaus standard. The PassivHaus Institute has pioneered a standard for low energy buildings. 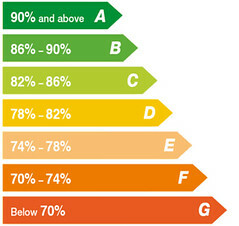 It includes very low energy usage and ways of achieving this. The word is derived from the idea of buildings which are fundamentally low energy and passive solar heated rather than using extra gadgets to heat them. See Passivhaus for the UK branch of the organisation. where a central heating system is not needed. The situation can be partially remedied by a good plumber who can balance the system well by doing a careful job of adjusting the check valves on radiators in conjunction with adjusting the pump to its lowest setting to function properly (saving electricity). This can take some achieving because most plumbers are quite dismissive about doing this, partly out of a kind of ignorance of the importance of balancing low energy systems and partly because it can be a very lengthy job to cover all the combinations of radiators being on or off and the plumber feels he is perceived to be wasting time. When possible it is best to situate a boiler next to a service duct . This will work well for the pipe runs, the condensate outlet and the flue, particularly if the duct is next to an external wall.